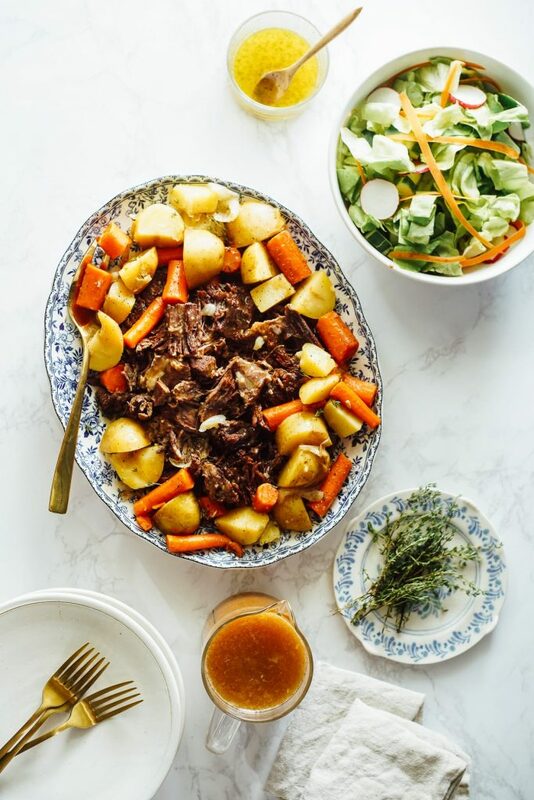 Pot roast is one of the meals from my childhood that will always bring up the fondest of memories. Today, we’re going to make it in the Instant Pot. My mom was a busy lady when I was a kid. She was a mom, worked full time, and during my elementary school years she also went back to get her master’s degree in social work. I didn’t realize it at the time, but watching her work hard doing what she loved (her family and her nursing career), all while pursuing a degree from a school that took her over 45 minutes to travel to, has forever impacted me as a woman. She was a diligent career woman and loving mother and wife. Thank you, Mom! Most of our meals during the week came from a drive-thru or were processed food options. This was the early ’90s and processed food was the norm. Plus, Mom was busy. She would go from studying to working to picking me up at school to taking me to cheerleading to campus life. Come Sunday evening, the busyness stopped. Not only would Mom prepare a roast, she would also dress the table with the finest china that had been passed down from my dad’s family, along with her favorite tablecloth, cloth napkins, candles, and real silverware. I remember times when my dad would suggest we use something other than china and tablecloths. He was always met with “the look.” This was tradition. This was a special time. And my mom made sure the heirloom china and a tablecloth were always part of the special tradition. It’s been 14 years since I lived in my parent’s home, and I still think back on Sunday evening to the pot roast being taken from the slow-cooker and presented on the dressed table. And you know what? I wasn’t ever wild about the pot roast itself. Sure, it was good. But what I loved was the time spent with my family. The one time in the week when things slowed down and we talked about the upcoming week, what had happened over the previous week, and we shared a meal together. A meal that we had anticipated all day. 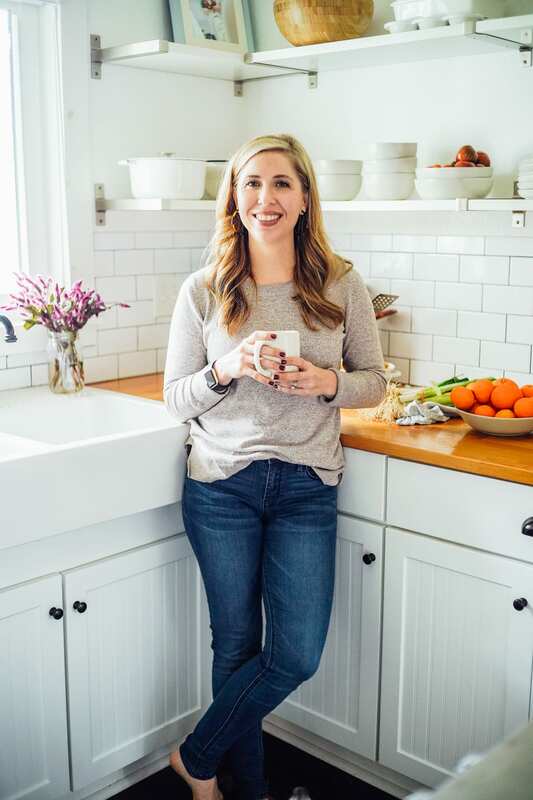 (Real) food is about nourishment, but I think it’s so easy to get caught up in the making of this food and the nutrients that we forget how special a meal can be. Making real food is about more than just eating food, or even the nutrients that are found in that food. Making and serving real food brings people together, around a common bond. Making food is a loving expression and an invitation to slow down and savor something, with the people we love and care about. That’s what pot roast was for me as a child. That’s what I want real food, and the special traditions we have surrounding certain meals, to be for my children. Making a pot roast usually requires cooking all day or, at least, waiting all day. 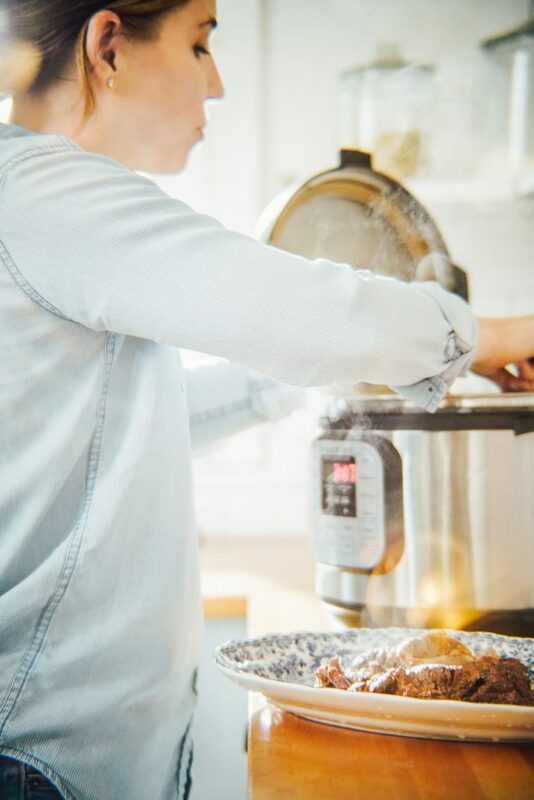 The Instant Pot changes this by taking a meal that should take 8 hours to cook, and does the job in just about 2+ hours. I know, that’s still a lot of time, but it’s a drastic improvement from 8 hours. 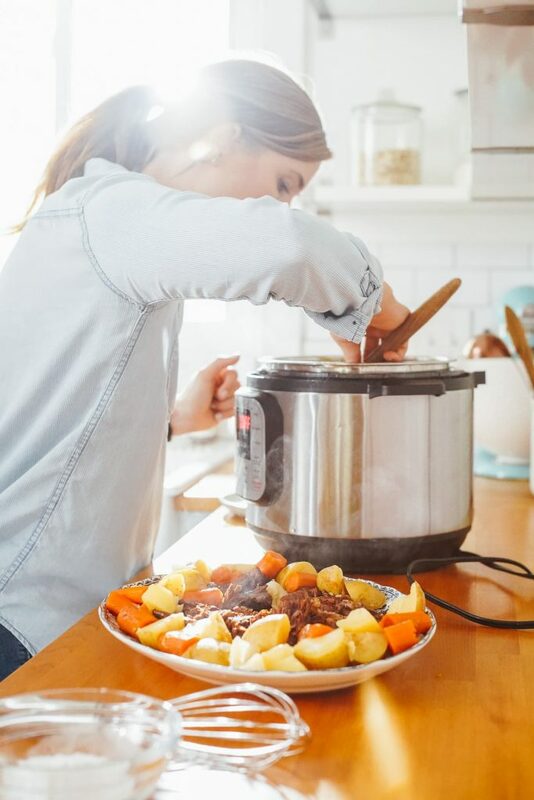 While the time difference is appealing, I think the best part about making a roast in the Instant Pot (or electric pressure cooker of your choice) is how perfectly this appliance cooks the meat and veggies. I’m talking about perfectly moist meat that falls apart. And veggies that are soft but hold their shape. 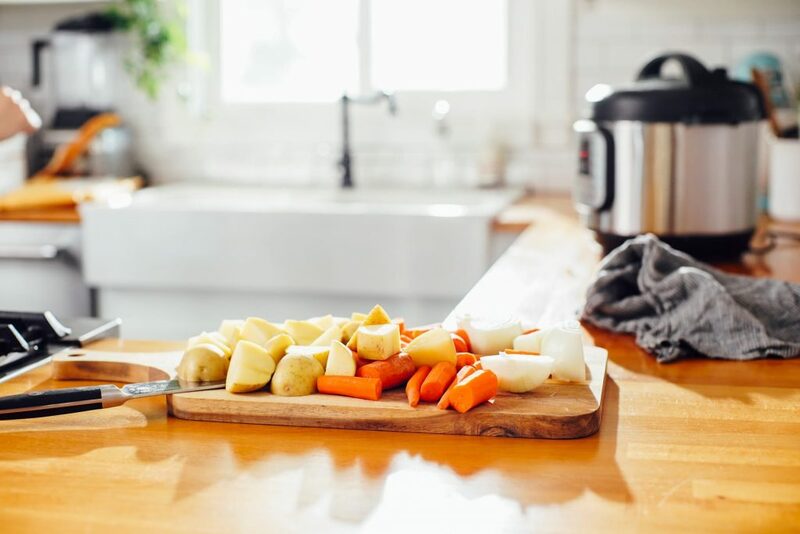 <–If you’ve ever placed veggies in the slow-cooker you know that “hold their shape” isn’t something that usually happens. 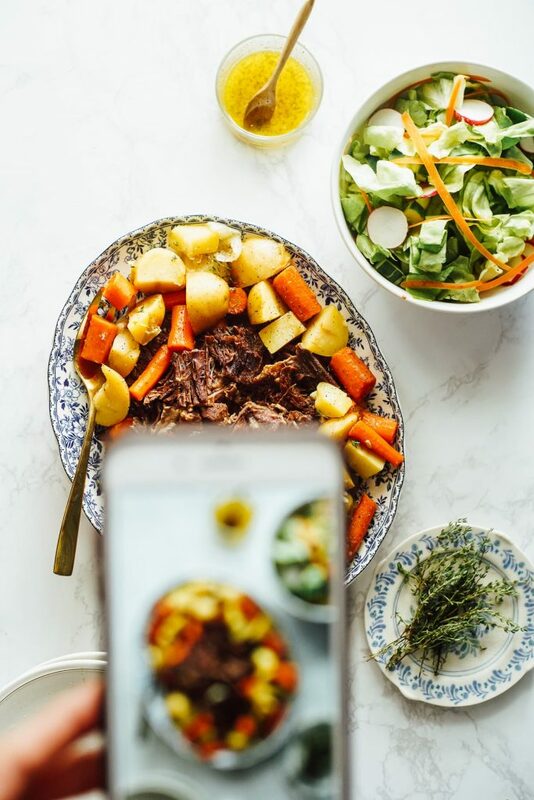 The perfect one-pot roast with root vegetables and homemade gravy, made in the Instant Pot. Set Instant Pot to Saute, Normal. Once hot, add the olive oil. Season the roast with 3/4 teaspoon of salt, pepper, and paprika. Evenly season both sides of the roast with the seasoning. 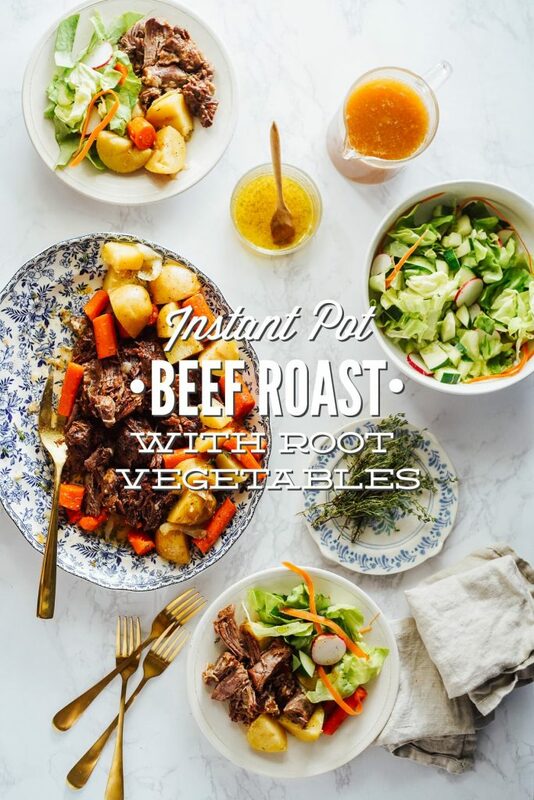 In the hot Instant Pot, sear the roast on both sides for a few minutes. Remove the roast to a plate. 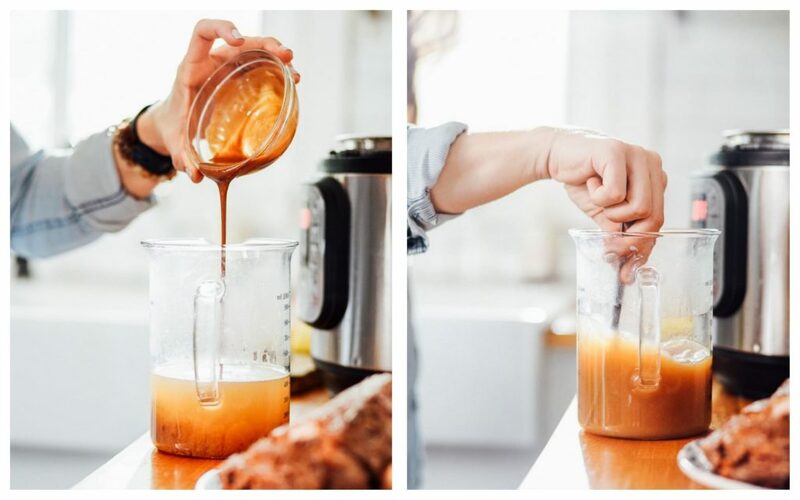 Using a medium-size bowl, mix the Worcestershire sauce, mustard, and 1 teaspoon of salt with beef broth/stock (or chicken or vegetable broth/stock). 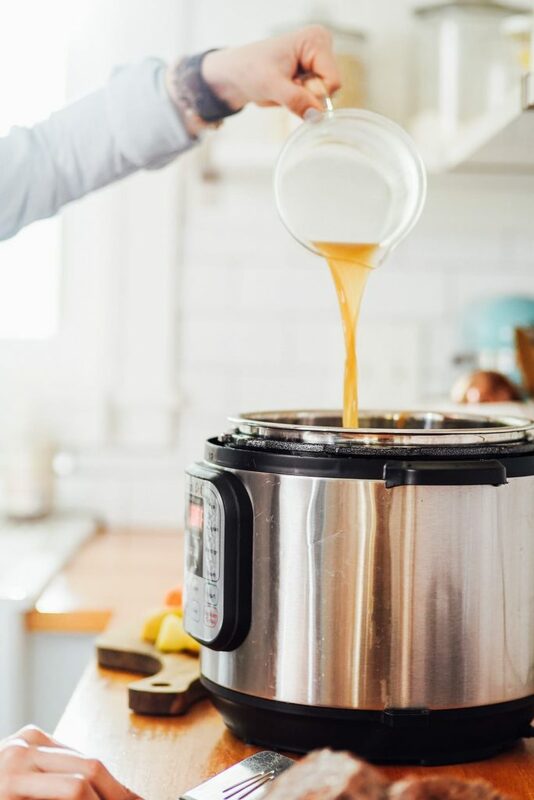 Add a bit of this liquid to the Instant Pot to scrape up any browned bits on the bottom of the pot. It is important nothing is stuck. If food is stuck on the base of the Instant Pot, you may get a burn notice later on. <--This is true with anything you make in the Instant Pot. Add the remaining broth/stock, bay leaves, and garlic to the pot. Set the roast in broth/stock. Cancel Saute mode and place the lid on the Instant Pot. Secure the lid and set to Sealing. Set to Manual, High Pressure for 75 minutes. While the meat is cooking, prepare the vegetables...Peel and halve the onions. Peel and cut the carrots into 3” pieces. Wash and quarter the potatoes. When time is up, let the pressure release naturally for 15 minutes. Carefully release remaining pressure and remove roast to a covered dish to rest. Add the prepared vegetables to the stock. Secure the lid and and set to Manual, High Pressure for 8 minutes. Perform a quick release when the time is up. Serve the vegetables with the roast (sliced or shredded). Remove the vegetables and create a slurry with the cornstarch by mixing the cornstarch in a small bowl with a small amount of water (about 3 tablespoons of water). Add the slurry to the liquid left in the pot. Saute until thickened for more of a gravy, stirring every couple of minutes to prevent anything from sticking to the bottom of the pot. Serve the gravy with the roast and veggies. The gold (or Yukon) potatoes used in testing this recipe were large, almost like regular baking potatoes. These are not mini potatoes. 4 full potatoes would be close to 2 lbs. It might seem annoying to cook the roast and then veg, but it really is worth it. This is worth the perfect texture of the veggies and the roast. 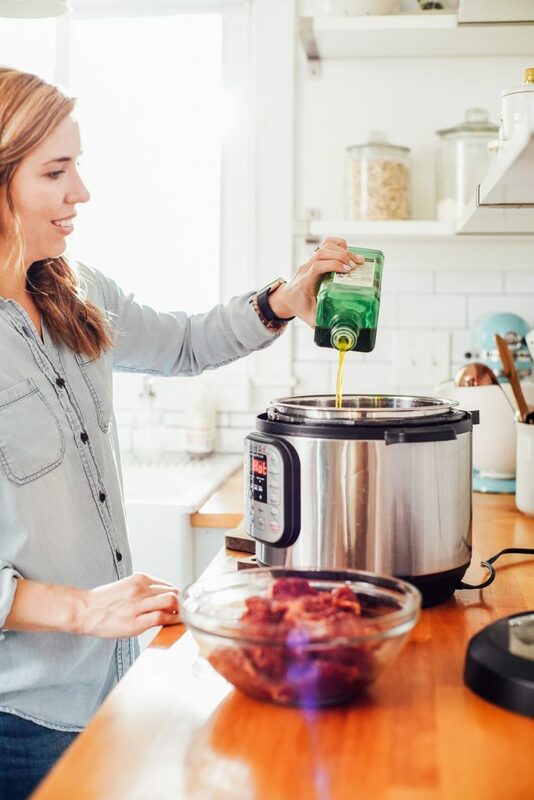 It can take at least 20 minutes for the Instant Pot to come to pressure with the meat in it, and still at least 10 for the veggie even with the hot stock. Worth it! This is a “Sunday dinner” type meal because it will take at least two hours from start to finish. 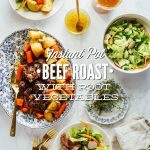 This is not what people think of as “instant” but it’s still faster than the oven or slow-cooker, and the Instant Pot cooks both the veggies and meat to perfection. The textures are absolutely worth the extra effort over “dumping” the meal in a slow cooker! Looks really good and I will definitely try this method!! I do get lazy with separating the vegetables so I usually cut super large (sometimes even whole) vegetables so they don’t get mushy. Thanks for this method! Thank you, Terry! Taking the extra time in the Instant Pot to cook the veggies is definitely worth it! Yay, Belinda! I’m so glad you enjoyed the beef roast. 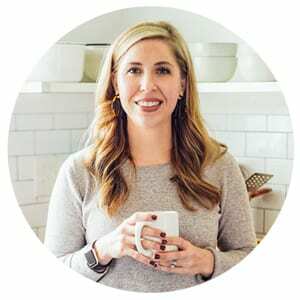 I am going to try this recipe in my mini instant pot. My only question is that you do not say when to cook the root vegies. I assume that you cook them after the meat is done. Between instructions eight and nine. This will keep the vegies from getting mushy. Am I right? Hey George, I apologize about that. It must have been lost when transferring the recipe. Thank you for catching this! I’ve updated the recipe instructions.